My brother loved God and served the church; until he was disappointed by his pastor. He walked away from Christianity because he did not expect disappointment and he did not know how to handle it. He was murdered two years later. What Are Signs of Spiritual Abuse? Joey became a Christian as an adult. He was 34-years old. Christianity was a stark contrast from his upbringing. It was fresh, clean, loving, and hope-filled. Each time they opened the church doors, he was there. Whenever there was an event, he was part of it. He loved God’s Word and was not shy about sharing it with others. His life began to make sense. He was soon baptized, began singing in the choir, and doing whatever he could for the church. Whenever there was a need, Joey volunteered. The first couple years went well. Joey felt loved by the church leadership, and he believed there was a purpose for his life. Then one day, for seemingly inexplicable reasons, he had a misunderstanding with his pastor. When I later talked to him about it, he said it was a trivial matter that should not have gone to where it did. Regardless, he and his pastor got into a heated argument. They said things that they both would later regret. Though Joey was a Christian, he still had a hot temper, especially when things did not make sense or were not going his way. What he did not realize was that his pastor was similar, and when they disagreed, things went wrong quickly. Joey was hurt and disillusioned by what happened. Though he had sinned against his pastor, his pastor also sinned against him, and they both were too stubborn to reconcile (1 Peter 5:3). Joey did not know how to deal with his hurt. That event was not the first hurt or disappointment in his life; it was the biggest because of the unexpected nature of it. Joey was not mature enough to know that being a Christian does not insulate you from disappointment (Philippians 1:29). After the conflict had simmered, he left the church. He poured himself into his landscaping business and became successful at it. There seemed to be little he couldn’t do well, but there was a fatal flaw in his new plans. As we talked, I began to notice a pattern in his life. Joey was never satisfied with anything he did. There was always a low-level discontentment that lingered in his heart. Joey was a man in pursuit of something, though he was not sure what that something should be. Initially, I thought he was primarily in search of God when he became a Christian, but that was not the whole truth. He was mainly in pursuit of filling a deep void in his life. He tried many things before he “came to God” and none of them worked. After he came to God, he found what he had been looking for–heart level satisfaction. He saw Christianity more as a tool to satisfy his deepest dissatisfaction rather than an opportunity to glorify God (1 Corinthians 10:31). He came to Christ like most of us—hoping to have a better life. Though he would not say it this way, he was using religion as a vehicle to satisfy his longings. I think his salvation was authentic, but because he did not have a comprehensive understanding of suffering, he was not able to understand the redemptive purposes of his disappointments. Rather than responding as a mature Christian should, he responded as an immature believer: he left the church. His disappointment with God through the debacle with his pastor was a bitter pill for him to swallow (Hebrews 12:15). Not able to guard his heart (Proverbs 4:23), he began to see religion like all the other things he had tried. His disappointment with God began to mount. With religion in the rearview mirror, he set sail for other opportunities to fill his insatiable void. And, as you might predict, he never found satisfaction in anything. He lost hope. It was late on a Friday evening in April 1997 when he got into his last heated argument. This time it was with his wife. That disagreement ended after she shot him five times with a pistol. Joey was my biological brother. Reflecting back on his life, I see a consistent pattern of disappointments. Each disappointing moment built upon the previous one. It created an accrual effect in his soul. Like walking down a dark staircase, each disappointing step led to increasing hopelessness. Joey was able to overcome most of his disappointments because he had found the Lord, but he could not overturn his final disappointment because God was opposing his defiant heart (James 4:6). He believed he had no choice but to join himself to that growing number of believers who have embraced our culture’s critical spirit. Joey became a Christian cynic. Cynicism is a hopeless attitude that ultimately reveals a rebellious heart. It is a form of anger that is mad because the person is not getting what he wants. It is a self-justified, self-pity party. It can happen. It has happened to me. You have probably been tempted toward cynicism too. Because of the sprinkling of disappointment throughout life, it is easy to become a cynic. Without a full view of the Lord and how you are to live as a mature believer in His world, your heart can betray your allegiance to Him. You can become a critical child of the King. This migration to cynicism begins as you drift from the cross. Each step away from Calvary brings incremental darkness to the soul. To become a cynic is to lose all sight of Calvary. Cynicism creates a numbness toward life. Spiritual apathy is what happened to Joey. It began with one disappointment that his heart was not prepared to encounter. The numbness continued to grow as more and more disappointments–-big and small–-came into his life. Joey had lost his childlike spirit. His disappointments overshadowed his zeal for the Lord (Romans 12:11). Joey believed a bruised reed the Lord would not break, and a smoldering wick He would not quench, but his reed felt broke, and his light felt extinguished (Matthew 12:20). The nemesis to the joy-filled life is doubt—the counter to faith. Without exception, your relationship with the Lord will diminish proportionally to the degree that doubt gains an advantage in your life. The natural temptation to being hurt is to withdraw. Isolation is an instinctive response when pain comes your way. The first blow may cause you to pause and to ponder. If you’re not careful, the succeeding blows will cause you to retreat and become distant. 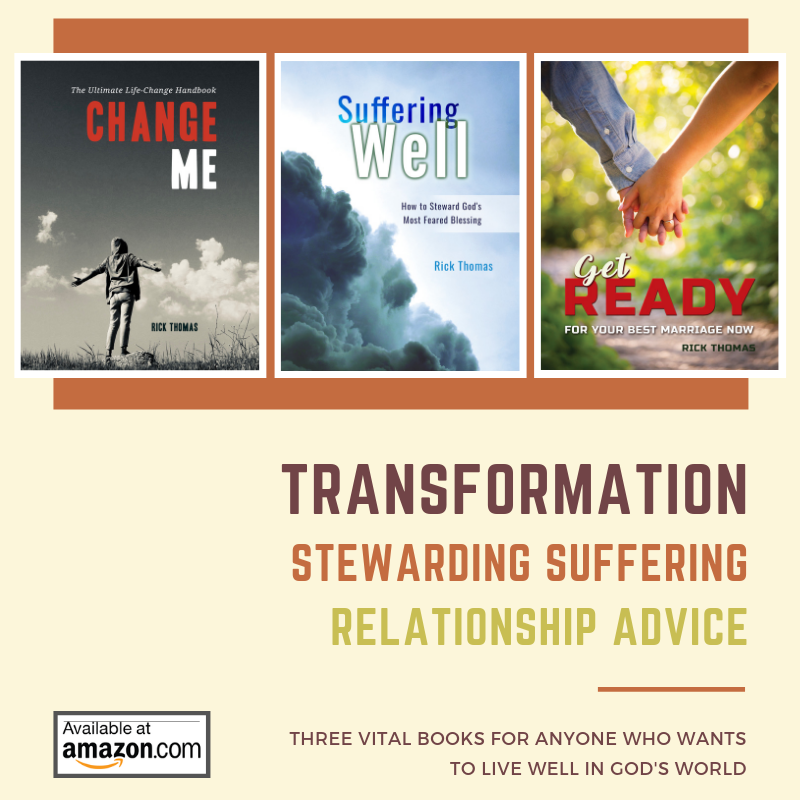 While there is a measure of common sense to this approach, it can be spiritually debilitating if you do not factor God into the suffering you are experiencing. Becoming spiritually distant is a characteristic of cynicism. Typically this kind of distance is not recognized until it is too late because spiritual withdrawal is not quantifiable. At best, it’s a subjective assessment. Before anyone recognizes spiritual coldness for what it is, the creeping and developing bitterness has already deadened the spirit. You only become privy to this when the cynic begins to speak. They are critical people. Rather than engaging the evil in their world, they have grown tired, numb, and distant (Galatians 6:9). It’s not that they are not aware of what is wrong; it is that they are not willing to engage with faith the wrongs they perceive. It’s similar to the guy sitting in the back row of a church meeting with his arms crossed, criticizing all that he sees, while maintaining his fortified distance. His observations are accurate, but his attitude smells to high heaven. Being a detached critic is the cynic’s way of protecting himself from crushing disappointment. It also paralyzes him from doing anything for God. The cynic is weary and afraid of being hurt again. The best he is willing to do is criticize. 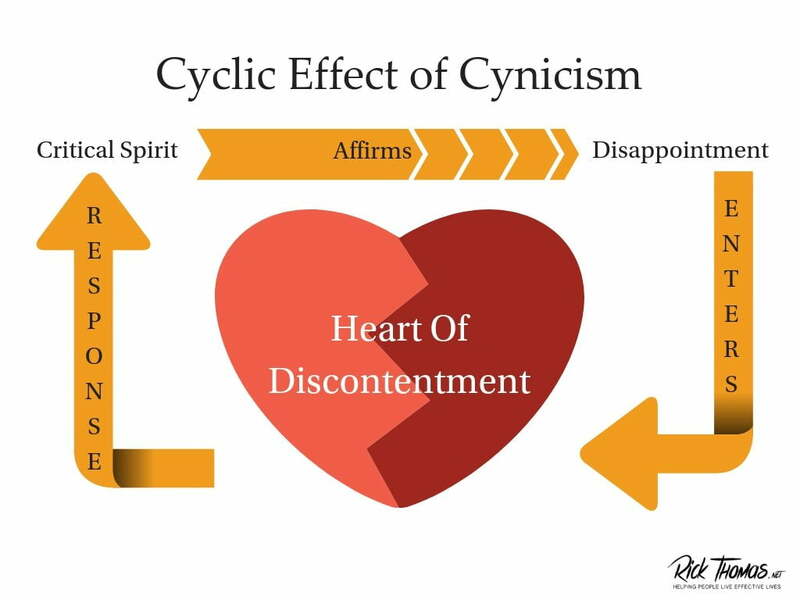 There is a cyclic effect to cynicism. It begins with disappointment. Being let down is the point of contact in a person’s soul that you must challenge. If you do not, the disappointment will gain a foothold and fester and spread. The disappointment will feed the pre-existing discontentment. The response of the discontented is to be critical. The criticism will affirm the disappointment, and the cycle continues. When the criticism is against God and His church, the person is willfully shooting himself in the foot which is further complicated by the individual’s justifications for being a critical spirit. This attitude leads to increasing frustration. It is nearly impossible to get a person out of this self-destructive cycle. Usually, it takes a life-altering event to bring them to their senses. The more frustrated they become, the more they try to fill their discontentment with things, events, work, and relationships. Nothing works. All they get for their efforts is weariness. All things are full of weariness; a man cannot utter it; the eye is not satisfied with seeing, nor the ear filled with hearing – Ecclesiastes 1:8. Our low-level doubt in God’s goodness opens the door for bigger doubts until we hardly care anymore. Initially, our thoughts were about what God wanted, but now the focus has shifted. You must challenge this kind of misguided thinking. Two specific and core Christian teachings are missing in the cynic’s world view. The chief end of man is to glorify God–to make His name great in all the world. Sometimes God uses personal suffering as a way to make His name great in our lives. It is hard for disappointed people to see the active goodness of God in their lives. Their blindness is why you need to challenge them lovingly. When my greatest disappointments came, I questioned God’s active goodness in my life. I could not see past my troubles. I needed someone to confront me because my soul was adrift. One of the most important aspects of the gospel is transformative suffering. Though we understand Jesus dying on the cross, we disconnect what happened to Him as something that should happen to us: dying to ourselves for the greater good of others. Death is painful, and when it comes knocking on your doors, the first instinct is to run from it, not embrace it. Even our Lord asked for the removal of the cup of death (Matthew 26:39). If you are a beat up and disappointed Christian, the good Lord has a word for you. He loves you (John 3:16), and He is for you (Romans 8:31). His desire is not for you to be overcome by evil, but to overcome evil through His strength rather than your own (2 Corinthians 1:8-9). Part of how you are to do this is by engaging, not retreating. Your first call to action is to find community. There is a reason isolation is one of the oldest tricks in the devil’s playbook. It’s effective. His mission is to divide and conquer. If you have separated yourself from the body of Christ, the drift in your soul has begun. The division has happened, and the conquest is at hand. My brother would not listen to my appeals. You can do better than that. Will you come back to the Lord as evidenced by rejoining His body?